The house called ‘The Cottage’ was on the corner of Horseshoe Lane and Gillingstool. When street numbering was introduced in the early 1950s, the house became number 1 Horseshoe Lane. However in many of the records we have looked at it is referred to as being in Gillingstool Hill, Pullins Green and even St John Street! We are not sure when the house acquired the name of ‘The Cottage’. Older documents do not mention any name. Indentures dated 1955 and 1957 call it ‘Corner Cottage’. An indenture in 1959 says that it is now known as ‘The Cottage’. The same name is used on documents and plans relating to the town’s re-development in the 1960’s. We do not have any decent photos showing this house. The one above is the best we can do. 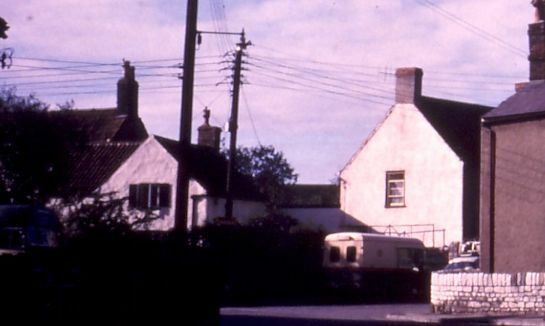 This was taken in 1964 looking towards the house from Pullins Green. The Cottage is the little white cottage in the centre of the image. We would love to hear from anyone who has a better photo. We also have an aerial photo of the house which can be seen by clicking on the link given below to the early history of the property. We do have the following description of the house from when it was put up for sale at auction on 12th December 1950. ‘An attractive freehold cottage with vacant possession. The valuable detached cottage with garden situate at the corner of Horse Shoe Lane with good frontage to the Gillingstool Road, close to the centre of the Town, bus services and school. The Cottage is stone-built, rough-cast over, with tile roof. It contains 2 bedrooms, front sitting room with tiled fireplace, dining room with tiled corner fireplace and lean-to kitchen with ‘Beetonette’ range sink, built in cupboards and asbestos roof; also W. C. detached galvanised iron wash-house with boiler and concrete floor. All main services connected. In the productive garden are three fruit trees and concrete paths have been laid’. The 1840 Tithe Survey shows that there was a small house on the site at that time. This was owned by Thomas Wise and occupied by John Lydiard. Thomas Wise was married to Ann Child Cossham, a great great grand-daughter of the original owner of the property, Thomas Smith. Later maps in 1881 and 1969 show that the house has been extended several times. Following Thomas’s death on 8th May 1871, the rate book of 1885 shows the property was taken over by his son, Edward Wise and son-in-law, Lewis Wallington. Lewis died in 1885, the 1890 rate book shows that Edward became the sole owner of the property, although he carried on living in Blackburn until his death in 1905. Edward’s two unmarried daughters, Charlotte and Ann Wise, continued to be the owners of the properties until their deaths in 1916 and 1937 respectively. When Ann died on 15th December 1937, her executors and trustees were charged with selling the property. Mary Veronica Wicker – bought the property on 1st August 1944 for £615. Mary was described as a married woman of 12 Aubern Road, Redland in Bristol. At the time of the sale it was described as ‘A valuable and desirable freehold cottage and garden situate adjoining the Gillingstool Road and Horseshoe Lane and until recently in the occupation of Mr. Harold Riddiford. The detached cottage is stone built rough cast over and has a pan tile roof. The accommodation comprised Front Living Room with modern fireplace. Kitchen with ‘Beetonette’ range and cupboard, Lean to Scullery with sink and boiler, W.C. and two Bedrooms. Companies Electricity, Gas and Water; Main Drainage. Good garden containing approximately 10 perches with galvd Coal and Tool Shed’. Mary didn’t keep it long. She must have bought it intending to make a fast return on the investment. She sold it on 25th September 1944 for £750. Philbert Oswald Willcock – on 25th September 1944 Philbert bought the property from Mary Veronica Wicker for £750. Philbert was described as a sheet metal worker of Blanchworth House, Dursley. We don’t know much about Philbert. He married Edith Ann Hambley in Camelford area of Cornwall in 1935. They are listed in the 1946 and 1950 electoral register as living in Thornbury. They sold the house in 1951 and there is no further sign of them in Thornbury. Philbert died in Bristol in 1965 aged 64. When the house was put up for sale in December 1950 its description was very similar to the one published in 1944 which is described above. They had however added some extra information to tempt buyers – mentioning that the lean-to had an asbestos roof and the washhouse was a detached galvanised washhouse with boiler and concrete floor. The garden had three fruit trees and a concrete path had been laid. Wilfred James and Norah Elizabeth Parker – on 18th January 1951 Wilfred bought the property from the Willcocks. At the time of the purchase he was an accountant living at The Steps, North Wraxall near Chippenham for £950. The 1954 electoral registers shows that Wilfred and Norah were living in The Corner Cottage, 1 Horseshoe Lane. They appeared to move to Thornbury to be close to Norah’s brother, Robert Francis and Betty Bayntun, who had moved here about 1950. Wilfred and Norah had two children: Diana and Jimmy. On 22nd August 1955 Wilfred Parker sold the property to Joyce Twelvetrees for £1650. Wilfred was living in the property at the time of the sale. We don’t know where they moved to when they left the house. They are not listed in the 1958 electoral register. Joyce Twelvetrees – on 22nd August 1955 Joyce bought the property from Wilfred Parker for £1650. At the time of the purchase she was living at Pump Cottage, Little Rissington. She didn’t live here long. On 23rd December 1957 Joyce sold the property to Maud Evelyn Ayre of the Spinning Wheel, High Street, Berkeley for £2000. We had been told by a couple of locals that a Mrs Twelvetrees had lived here, but they knew nothing more about her. Thanks to the wonders of the Internet, we have discovered that Joyce was quite famous. Joyce Dallimore was born in Nuneaton on 20th February 1911. She was the daughter of John Edward Dallimore, a clergyman and his wife Hannah Annie. The 1939 register of the population undertaken in preparation for the War shows Joyce was working as a private secretary in a steelworks. She was living in Stockbridge in Yorkshire at that time. Joyce married Arthur Edward Godstone Twelvetrees in the Ilkeston area of Derbyshire in 1941. Arthur was the son of Edward Dudley and Louisa Twelvetrees. Tragically, Arthur was killed on 4th September 1942 aged 24. He was serving as a Lieutenant in the 70th Battn Hampshire Regiment. We were lucky to find an Australian newspaper report called The Age dated 9th October 1958. This mentioned that Joyce had recently moved to Melbourne as was noted as being Australia’s only female meteorologist. Joyce had attended London University and obtained a BA in Geography. During the war years she worked as a forecaster for the WAAF and after she joined the Met Office in London for a few years. Then she worked as a secretary, a teacher and helped with the compilation of a book. In 1954 she was living in Little Rissington in Gloucestershire and presumably working at the weather station in the nearby RAF base. We assume Joyce moved from there to Thornbury in 1955 to work at the weather station based in Filton. The Eyres – we had understood that the house was occupied by ‘Miss Norah Ayres’ a sister and matron at Thornbury Hospital. However we have discovered from the deeds that it was Maud Evelyn Eyre who bought the property on 23rd December 1957 for £2000. At that time Maud was living at The Spinning Wheel, High Street, Berkeley. On 3rd June 1959 Maud also bought the adjoining property, 3 Horseshoe Lane, from Emily Minnie Riddiford for £875. This indenture shows Maud was living at 1 Horseshoe Lane at the time. On 26th October 1960 Maud sold 3 Horseshoe Lane, after hiving off the piece of land which connected the house with Horseshoe Lane. This piece of land was added to the garden of 1 Horseshoe Lane. It is interesting to see that Maud made a sizeable profit on the dealings as the property as well as expanding the garden of her property. The house she bought for £875 in 1959 was sold a year later for £3400 despite it being a smaller property. Maud was the daughter of George Francis Truscott whose family business was Truscotts, the jewellers based in Gloucester. In 1934 she married Nevill C Eyre in Bristol. They had one son, John Vickers, born on 30th April 1936. Maud and Nevill were later divorced and Maud married again at the Bristol Register Office on 3rd February 1968. Her second husband was Alexander John Charles Wallace, another divorcee. Alexander was aged 65 and Maud was 62. Both were Company Directors in a firm of jewellers (presumably Truscotts) and they were living in Westbury Park, Bristol. Alexander was the son of John Wallace, a Captain of the Black Watch. The 1961 electoral register shows Maud was living at 1 Horseshoe Lane. Her son, John, was also listed, but was absent in the services at the time. On 20th May 1968 Maud Evelyn Wallace then living at 23 Downs Park East, Westbury Park, Bristol sold 1 Horseshoe Lane to her son, John Vickers Eyre, Captain in the Army (living at the same address) for £3050. From information on the Internet, we found that John (shown in the photo on the right) had been a Major in the Royal Horse Artillery and the King’s Hussars. After serving in the Army he became an Assistant to the Chairman of Savoy Hotel PLC, administrator for Brian Colquhoun and Partners and the proprietor of Haresfield Garden Centre. In 2005 he was living at Boyts Farm, Tytherington with his wife, Sarah Margaret Aline (nee Heywood). 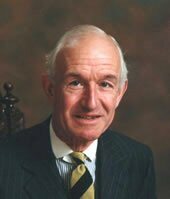 He is listed as being a J. P., Company Director of George Truscott ltd 1986 – 2003, High Sheriff of Gloucestershire 2001/1, Deputy Lord Lieutenant of Gloucestershire in 2000 and became Vice Lord Lieutenant in 2007. He also obtained leading positions in the Berkeley Pony Club, the Berkeley Hunt and the Gloucestershire Branch of the Royal British Legion. On 18th March 1970 John sold the property to Thornbury Rural District Council for £4600. At the time he was said to be still living at 23 Downs Park East, Westbury Park, but other documents mention his address as Catherines Holt, Stone. Maud died in the Stroud area in 1998 aged 93. The Council demolished the house and they used the land to widen Rock Street and Grovesend Road and incorporated the rest in the Rock Street Car Park.